All transactions are safe and secure with a reliable history in online purchasing behind each of our associates. 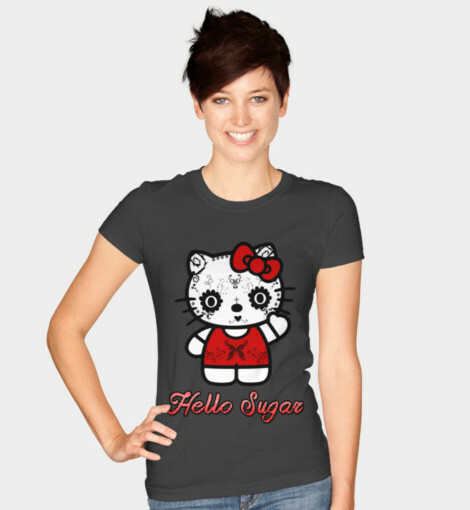 Buy the Hello Sugar t-shirt to own Hello Kitty clothing and merchandise. Celebrate the Day of the Dead or any day of the year in this calavera-inspired Hello Sugar shirt. Kitty White has decorated her face for the celebration and can be seen waving to the crowd. Hopefully, she won't scare off Dear Daniel, her boyfriend. Attend the festivities in style in this Hello Kitty t-shirt. Wear this piece of clothing to let everyone know that you've got a dark side behind your tender exterior. In addition to the Hello Sugar tee above, browse the Hello Kitty Clothing Gallery for more apparel like men's and women's clothes, kids shirts or hoodies.